Today the New York Times reported something so vile, so corrupt and dangerous, that it managed to surprise even me: Jared Kushner, along with other Trump officials, have been pushing a plan to sell nuclear technology to Saudi Arabia. It just doesn’t get any worse. This is exactly the scenario federal employees hear about in ethics training, and as justification for why they must go through the rigorous and intrusive security clearance process. Ethics instructors say the process is designed to ensure that a person of dubious character or with financial problems will not be in a position to sell our nuclear secrets to the highest bidder. Clearly, there is a flaw in our system, when the President of the United States and his family members do not have to pass the same background investigation others do in order to gain access to military secrets. There is also a flaw in the system when we have to sit back and learn that congress has known for months that our president is considering transferring sensitive nuclear technology to Saudi Arabia to benefit the same company that bailed out Jared Kushner’s failing 666 Fifth Avenue property. This is alarming. 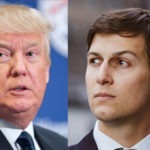 That there is no recourse available to immediately remove Trump and Kushner from their positions, while an investigation is finished, is a flaw in the system – and it has the potential to break the system. While I have high hopes for and a high opinion of Bob Mueller, I have to ask, what does it take for him to sound the alarm? How far do we let Trump go before action is taken? The more we learn about what has been going on, the more Rod Rosenstein’s reported offer to wear a wire and his reported consideration of invoking the 25th Amendment, seems not only appropriate, but rather mild and measured. Do we have to wait for Trump to actually deliver nuclear secrets to the Crown Prince of Saudi Arabia, the same man that just ordered the murder of US resident and journalist, Jamal Khashoggi, before someone takes action? How much more evidence do we need? What exactly are we waiting for?